Bad breath, known technically as halitosis, is an ailment that affects many of us and which can be very difficult and embarrassing to live with. Bad breath as we know is characterized by pungent and unpleasant smelling breath which can be embarrassing every time we open our mouths to talk. When it’s very severe it can be enough to stifle our progress at work, and can certainly affect our relationships. There are many causes of halitosis and many things which can contribute to it, and likewise there are lots of remedies and ways to suppress the problem. Here we are going to look specifically at some of the foods which can contribute to bad breath. If you struggle with halitosis then avoid these foods. How Can Foods Cause Bad Breath? We will list some of the main culprits in a moment, but first it is important to understand the mechanisms behind your bad breath and to know how many of them contribute. Understanding this can help you to make judgment calls in future situations and to work out for yourself if something might create a bad odor in your mouth. Some foods that create bad breath do so in a very simple way – by smelling themselves. This is true of things like garlic and this simply means that your breath ends up smelling like garlic and it takes a long time for your body to naturally wash that smell away through running saliva etc. This is obviously especially the case if any of those foods get stuck between your teeth and over time this smell will get worse. If you eat something like garlic or hummus, it’s no bad idea to clean your teeth afterward to get rid of any residual particles. Some foods will create a bad smell if they smell unpleasant but won’t last long after you’ve eaten – the reason that garlic (and onions) are particularly bad is because they contain certain sulfur compounds which are the compounds that cause halitosis in the first place! 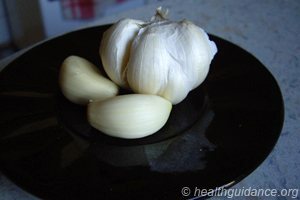 While you may not have a problem with sulfur in your mouth, by eating garlic and similar foods you are just introducing it into your mouth and it can be hard to get rid of. The majority of bad breath is caused by bacteria. This is the main cause of chronic halitosis and sometimes changing your diet won’t be enough to solve the problem. This is also why you will find that your breath smells worst in the morning – during the night you do not produce as much saliva and this means that bacteria doesn’t get washed away. It is given a chance to collect and this leads to morning breath – and is why we should brush our teeth soon after waking. Drinking lots of water throughout the day is a good way to keep washing the teeth and the mouth and to encourage a flow of saliva – but conversely this also means that anything that can dry out your mouth can prevent it from curing halitosis naturally. Anything you eat or drink that causes you to become dehydrated – such as coffee or alcohol – can contribute then to bad breath. While this bacteria may not necessarily be caused by food, dairy products such as milk and cheese can contribute to it as they have their own active cultures which can interact with the bacteria in the mouth. The bacteria in the mouth also thrives on the amino acids contained in dairy. Your mouth can also start to smell as a result of acids which have a pungent smell. This means that seemingly innocent foods like orange juice can cause your breath to smell. Acid provides fuel for the bacteria in your mouth, as can very sugary foods, and they also contribute to the damage of healthy tissue. Acid in the mouth though can also be caused by digestive problems such as acid reflux (the clue is in the name). If you have difficulties digesting food then, something like red meat may not be a good idea. The body will struggle to digest this and it will then cause acid to get into the esophagus.